Touring Monterey, California with Kids - Monterey Seaside Family Lodging. Victorian Inn Itinerary: Monterey is a magical place for families. 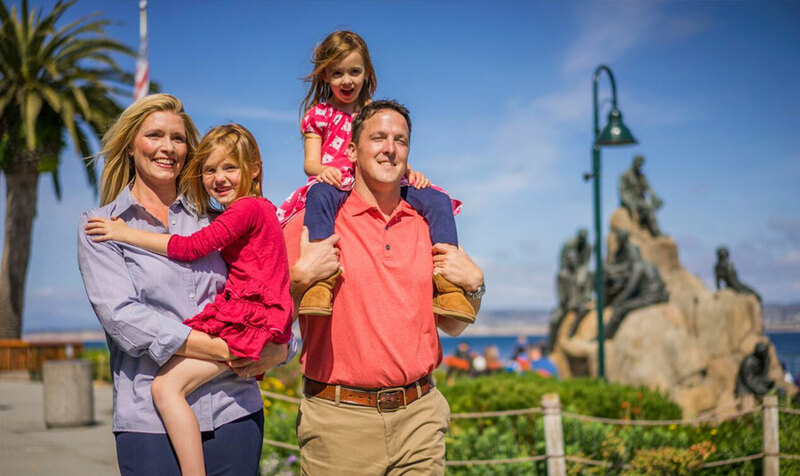 With plenty of exciting attractions including the Monterey Bay Aquarium, your family vacation to Monterey promises to be full of fun. Start your vacation with a trip to the Monterey Bay Aquarium located just four blocks from Victorian Inn. Spread your trip to the aquarium over two days with a convenient multi-day pass available at the hotel. After exploring touch pools and discovering playful penguins in the Splash Zone, head back to Victorian Inn for the complimentary wine and cheese reception. Later, dine at kid-friendly Willy’s Smokehouse. The mouthwatering BBQ restaurant is just two blocks from the hotel. Follow up a smokin’ meal with a cool favorite, ice cream from Dippin’ Dots. Start day two of your Monterey adventure with a delicious complimentary continental breakfast at Victorian Inn. Then, walk down to the aquarium to watch curious sea otters dive for their breakfast (feeding time is at 10:30am). After the aquarium, visit MY Museum, an interactive children’s museum, or ride a pedal-powered surrey along the coast to Lovers Point. At night, enjoy dinner at Bubba Gump where you just might catch a glimpse of Forrest himself. On your way out of town the next day, be sure to stop at Dennis the Menace Park. Kids love climbing aboard the historic steam engine train, running across the suspension bridge and finding a surprise in the center of the hedge maze. Hotel Pacific Itinerary: At Hotel Pacific, your family vacation to Monterey begins with welcoming refreshment upon check in to the hotel’s spacious jr. suite. Stroll to Fisherman’s Wharf, located just two blocks from the hotel, for a bowl of steaming clam chowder and check out resident Harbor seals sunning on the beach and rocks. Follow the pedestrian trail to Cannery Row for souvenir shopping before returning to Hotel Pacific for a good night’s sleep. After a delicious continental breakfast enjoyed outside in Hotel Pacific’s garden fountain courtyard, hop on the free trolley (runs Memorial Day through Labor Day)to Cannery Row and the Monterey Bay Aquarium. Learn about local marine life and ocean conservation at the aquarium before venturing outside to see animals in their natural habitat. Drive to Earthbound Farms in Carmel Valley later in the afternoon to sample locally-grown organic foods and participate in educational tours including the popular “Bug Walk.” Earthbound Farms also features a corn maze adventure for kids every fall. Take pleasure in a day trip down scenic Highway 1 to nearby Big Sur on your third day in Monterey. The waterfall at Julia Pfeiffer Burns State Park is spectacular and one of the most photographed in California.